For the ultimate Ghirardelli chocolate experience, look no further! We have gathered every Ghirardelli chocolate delight into one grand and sumptuous basket. Indulge every sophisticated chocolate whim with this magnificent gift of superlative sweets! For the ultimate Ghirardelli chocolate experience, look no further! 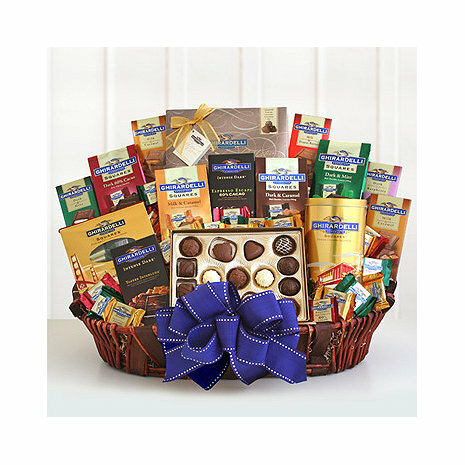 We have gathered every Ghirardelli chocolate delight into one grand and sumptuous basket. Indulge every sophisticated chocolate whim with this magnificent gift of superlative sweets! Let us entice you with a Masterpiece gift box of assorted chocolates, a heritage window tote of assorted Ghirardelli squares, Toffee Intense chocolate bar, Espresso Intense bar, carmel, dark, peanut and mint with milk chocolate bars, raspberry, caramel and mint filled squares and dark chocolate and caramel squares. Look out!